Ferret lymphoma (also referred to as lymphosarcoma) is an awful kind of cancer that is commonly seen in pet ferrets. It affects any and all lymphoid tissue and can spread throughout the entire body. It can also be difficult to diagnose and unfortunately, no cures currently exist. Lymphoma in ferrets is the same thing as it is in dogs, cats, and other animals. It is cancer that affects lymphoid tissue and depending on the area it is affecting, it is classified as multicentric, mediastinal, gastrointestinal, and extranodal. It is also classified as either low grade or high. Multicentric lymphoma is when the lymph nodes are affected and they are usually obviously enlarged. The liver, spleen and bone marrow may also be affected. Mediastinal lymphoma affects the lymph nodes in the thorax (chest) and may also affect the thymus gland. Gastrointestinal lymphoma, as the name implies, is found in the stomach and intestinal tract and may also affect other organs. Extranodal lymphoma can affect the skin, eye, heart, kidneys, or central nervous system. 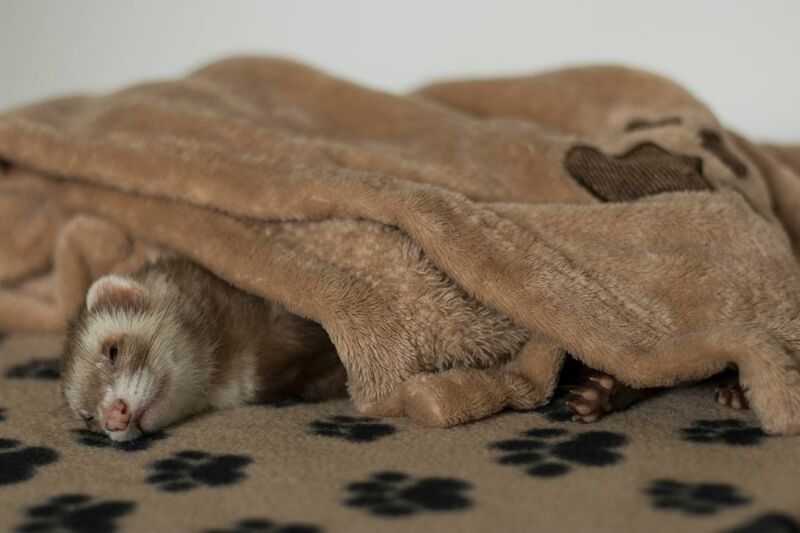 Since lymphoma can be found almost anywhere in your ferret's body it can be hard to diagnose. Your ferret might present with weakness, diarrhea, lethargy, vomiting, bloody stools, enlarged lymph nodes, itchy and inflamed areas of the skin, or even bleeding within an eye. With so many possible symptoms in so many different areas of the body, the disease is often treated symptomatically before a confirmed diagnosis is made. Bloodwork or cytology and biopsies of obviously affected areas of skin or visible lymph nodes will aid in a positive diagnosis. Increased calcium and low albumin levels in the bloodwork may reveal lymphoma, along with tumors identified through radiographs or ultrasounds. Often times a ferret is chronically ill and elective surgery is performed to explore the abdomen for possible abnormalities. This surgery usually finds some sort of lymphoma and/or other common ferret diseases such as adrenal disease or an insulinoma. If a biopsy of an affected lymph node is taken and is found to be positive for lymphoma, it will be assigned one of five stages. Stage five is the worst stage where the bone marrow or blood is involved in the disease process. Curing lymphoma is unfortunately not very likely. While chemotherapy is available, it usually only buys you a very limited amount of extra time. Oral steroids, such as prednisolone, are administered to help with the size of the tumors and typically some improvement is noted short term, but overall a very poor long-term prognosis (outcome) is expected. Treating lymphoma with steroids and symptomatically if your ferret has diarrhea, vomits, or a skin infection, are usually the options most ferret owners take. But intravenous (IV) chemotherapy drugs are available to the owner who wants to do all they can for their ferret. Lymphoma seems to be seen more and more often in vet clinics lately. While no one knows for sure what causes the many kinds of lymphoma, some are recently speculating it has something to do with a virus. Lymphoma has even been given from an infected ferret to a previously non-infected ferret with "cell-free extracts" in a laboratory but to date, no genes have been isolated, therefore we don't know exactly what causes it. As of now, there is nothing you can effectively do to limit the chances that your pet ferret will get lymphoma. But hopefully, one day that will change. If your ferret has any symptoms of lymphoma, such as diarrhea, lethargy, or weight loss, or you suspect he has another common ferret disease make sure you get him checked out by your exotics vet as soon as possible.